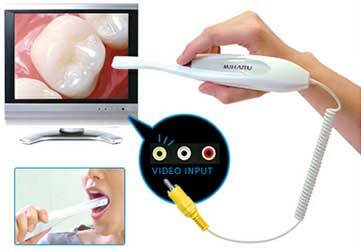 MIHARU is an easy yet effective intraoral camera. Simply plug into the video input of a TV / monitor or any display device with a composite (yellow) video input, and you can immediately view the intraoral condition on the video display. The remarkable Plaque Detector Mode helps yours patients to visualize dental plaque and tartar, which is illuminated in pink color. It helps to educate your patients on proper brushing technique and importance of periodic dental cleaning. Instant set-up in 10 seconds. Just plug it into your TV. STEP1 : Install 4 AAA batteries in the camera. STEP3 : Instantly display the image on your TV.